Most widespread kangaroo rat in California. Occurs in desert scrub and alkali desert scrub, sagebrush, Joshua tree, and pinyon-juniper habitats in southern California. Occurs in California from Benton, Mono Co., south to Olancha, Inyo Co., and Onyx, Kern Co., Colton, San Bernardino Co., Aguanga, Riverside Co., Campo, San Diego Co., and in all arid lands east to the Nevada and Arizona borders. Prefers sparse to moderate canopy on fine to coarse sands, with or without surface pavement or gravel in the subsoil (Beatley 1976a). Feeding: Granivorous, feeding opportunistically on the seeds of plants in relation to their availability and abundance. In spring, leafy vegetation is eaten, comprising as much as 10% of the diet. Arthropods are eaten seasonally. Brown and Lieberman (1973) found, in southern Arizona, that Dipodomys foraged more in open areas than under the shrub canopy. In California and Arizona creosote scrub habitats, 10% of the primary production was consumed, and in California, over 90% of the annual production of Erodium was consumed (Chew and Chew 1970, Soholt 1973). Cover: Burrows, with 2-5 entrances, most often located at bases of shrubs. Sandy soils are preferred but rocky flats are utilized, provided a burrow can be excavated. Reproduction: Burrow systems frequently are located under shrubs. Nature of soil and climatic extremes seem to be primary correlates with depth of nest. Water: Water is obtained metabolically from food and from moisture in food. Pattern: Uses desert flats, or slopes, with sparse to moderate canopy coverages and sandy to gravelly substrates. Activity Patterns: Active year-round. Daily activity begins and ends in bright twilight, after sunset and before sunrise, respectively (Kenagy 1976). O'Farrell (1974) reported that moonlight inhibited activity, but this was not substantiated by Kenagy (1976). Kangaroo rats in eastern California spent 1-2 hr (or less) on the surface, with surface activity frequently interrupted by retreats into the burrow. Seasonal Movements/Migration: No data found. Home Range: Chew and Butterworth (1964) reported densities of 0.3 to 3.7/ha (0.12 to 1.5/ac) in creosote scrub habitats in the Mojave Desert. Christopher (1973) found a density of 18.5 per ha (7.4/ac) in creosote scrub on the western edge of the Colorado Desert, and 2.6/ha (1.0/ac) in nearby pinyon-juniper communities. Soholt (1973) found densities of 13/ha (5.2/ac) in early spring, and 19/ha (7.6/ac) in fall, in a creosote scrub population. Territory: Aggressively solitary, though D. merriami seems to be the least aggressive species of the genus. Territory size less than home range. Reproduction: D. merriami may breed several times a year, although once is the norm. Reproductive activity begins as early as December, peaks in late March to April, and ends by summer. Females typically anestrous from July to September. Reproductively active males have been reported in all months of the year (Chew and Butterworth 1964, Chew and Chew 1970). Gestation period is 33 days (Eisenberg and Isaac 1963). Litter size averages 4 young (range 1-5). Weaning occurs 24-33 days after birth (Chew and Butterworth 1964). Females are capable of breeding shortly after weaning. Niche: Miller and Stebbins (1964) recorded that kit foxes and badgers preyed on this species. Other predators include snakes, owls, gray foxes and coyotes. Beatley, J. C. 1976a. 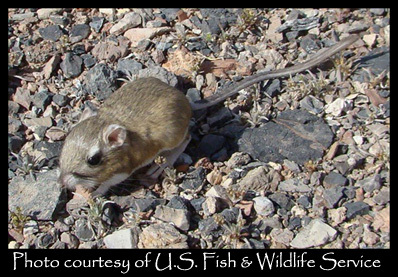 Environments of kangaroo rats (Dipodomys) and effects of environmental change on populations in southern Nevada. J. Mammal. 57:67-93. Brown, J. H., and G. A. Lieberman. 1973. Resources utilization and coexistence of seed eating desert rodents in sand dune habitats. Ecology 54:788-797. Chew, R. M., and B. B. Butterworth. 1964. Ecology of rodents in Indian Cove (Mojave Desert), Joshua Tree National Monument, California. J. Mammal. 45:203-225. Chew, R. M., and A. E. Chew. 1970. Energy relationships of the mammals of a desert shrub (Larrea tridentata) community. Ecol. Mongr. 40:1-21. Christopher, E. A. 1973. Sympatric relationships of the kangaroo rats, Dipodomys merriami and Dipodomys agilis. J. Mammal. 54:317-326. Eisenberg, J. F., and D. E. Isaac. 1963. The reproduction of heteromyid rodents in captivity. J. Mammal. 44:61-67. Kenagy, G. J. 1976. The periodicity of daily activity and its seasonal changes in free-ranging and captive kangaroo rats. Oecologia (Berlin) 24:105-140. Miller, A. H., and R. C. Stebbins. 1964. The lives of desert animals in Joshua Tree National Monument. Univ. California Press, Berkeley. 452pp. O'Farrell, M. J. 1974. Seasonal activity patterns of rodents in a sagebrush community. J. Mammal. 55:809-823. Soholt, L. F. 1973. Consumption of primary production by a population of kangaroo rats (Dipodomys merriami) in the Mojave Desert. Ecol. Monogr. 43:357-376.